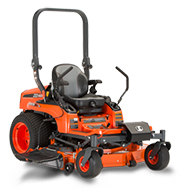 This compact diesel engine, side discharge mower is versatile and reliable to handle jobs big and small. Offering better fuel efficiency and cutting performance with an improved fuel/horsepower balance – keeping you more productive while saving you money. Maintenance Free - 12V, CCA - 430A, R - 80 min.